Gang Pan a professor of the Department of Computer Science, and deputy director of State Key Lab of CAD&CG, Zhejiang University, China. His current interests include artificial intelligence, brain-inspired computing, brain-machine interfaces, pervasive computing, and computer vision. He has authored over 100 refereed papers, and 35 patents granted. 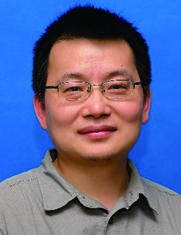 Dr. Pan received three best paper awards and three nominations from premier international conferences. He is the recipient of IEEE TCSC Award for Excellence (Middle Career Researcher), CCF-IEEE CS Young Computer Scientist Award, and National Science and Technology Progress Award. He serves as an Associate Editor of IEEE Trans. Neural Networks and Learning Systems (2019.1-), IEEE Systems Journal, Pervasive and Mobile Computing, and ACM Proceedings of Interactive, Mobile, Wearable and Ubiquitous Technologies (IMWUT). Recently, spiking neural networks (SNN) has received significant attentions for its biological plausibility. SNN theoretically has at least the same computational power as traditional artificial neural networks (ANNs), and it has the potential to achieve revolutionary energy-efficiency. This talk will introduce models and methods of spiking neural networks, some typical applications, as well as our recent work on SNNs.